The LG G2 has officially touched down, offering up a new flagship for the South Korean company - and a successor to last year's Optimus G.
The handset houses a 2.26GHz quad-core Qualcomm Snapdragon 800 processor with 2GB of RAM and a choice of either 16GB or 32GB of internal storage. Screen-wise, there's a full HD-boasting 5.2-inch display, which should nicely show off the pictures you take with the rear 13 MP camera. As for the battery, this is packing a 3,000mAh juice box. Altough a large handset, the phone is just 8.9mm thick. However, those of you hoping the phone would arrive with the new Jelly Bean 4.3, the bad news is that this is still running Android 4.2.2. There was plenty of emphasis on the Qualcomm Snapdragon processor being used, but perhaps even more so on the design, which moves the volume rocker and power buttons to the back of the handset. Shock horror! 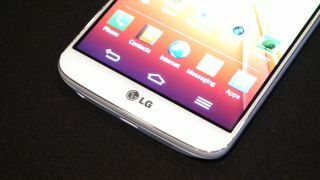 This is all part of LG's design "for one-handed operation", something that also comes through on the software side, with features such as Answer Me, which lets you answer the call by pushing the down volume button when the phone is raised to your ear. The phone will come to over 130 carriers around the world, and we'll let you know as soon as we hear more about the release specifics.